BACKGROUND: Endoscopic thyroidectomy has been proved to be a safe and effective alternative treatment of a benign small thyroid lesion. To perform this operation, the working space needs to be created. Initially, the space surrounding the incisions is directly made and endoscopic part is followed. The appropriate working space is then endoscopically harvested with the ultrasonic dissection. This part could make the operative time unnecessarily long. Some techniques are compromising with an initial big incision that allows the space to be completely created under a conventional manner. We propose that this space can be safely and shortly created via a small incision. METHODS: Our 3-port transaxillary endoscopic thyroidectomy begins with a 1.5-cm incision. The appropriate working space is bluntly harvested with our “Chula thyroid space creator” which is a 1.5-cm. largest width and 30-cm length metallic instrument. Two 5-mm ports are introduced. Finally, a 12-mm Hasson port is placed and endoscopic dissection continues. RESULTS: From February 2004 to September 2008, 71 patients underwent endoscopic thyroidectomy in the department of Surgery, Faculty of Medicine, Chulalongkorn University. Forty of 71 were transaxillary approach. Twenty seven of this 40 cases were utilizing the blunt thyroid space creator. The space was successfully created without any major complication. There was a minimal bleeding that required no additional intervention. 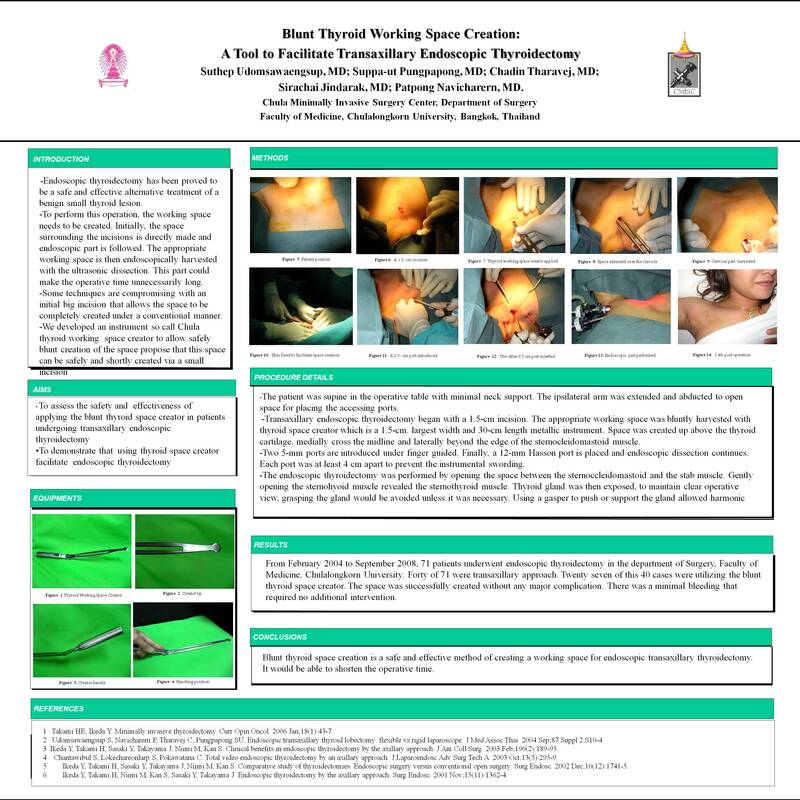 CONCLUSION: Blunt thyroid working space creation is a safe and effective method of creating a working space for endoscopic transaxillary thyroidectomy. It would be able to shorten the operative time.